William Brake was the son of James Hugh Brake and Barbara McDougall and was born in Horsham in 1893. James Brake was born in the Cavendish district and at an early age went to work for John Thomson & Co. in Gray Street. He eventually was the manager of the store and was in partnership with the Thomsons in stores in Horsham & Portland called Thomson & Brakes. William went to work at Thomsons as a clerk. He was a well-known and well-liked man about town and his name was regularly in the sporting results of the Hamilton Spectator for everything from croquet to golf. He played mixed doubles tennis, competed at athletics meets and was an accomplished player for the Caledonian Football Club in Hamilton. In late 1914, the Brakes moved to Mont Albert, but James Brake continued to manage Thomsons from Melbourne. An article in the Hamilton Spectator at the time lamented the loss of William Brake to sporting teams across Hamilton. Twelve months later on 12 November 1915, William enlisted joining the 4th Field Artillery Brigade. Early in 1916, he transferred to the Australian Flying Corps (AFC) as a mechanic. His brother James was a Captain in the AFC. William returned to Australia in 1919 having served in the Middle East and France and escaped with no physical scars. His two brothers, John and James also returned. His other brother Stan remained in Hamilton working at Thomsons. 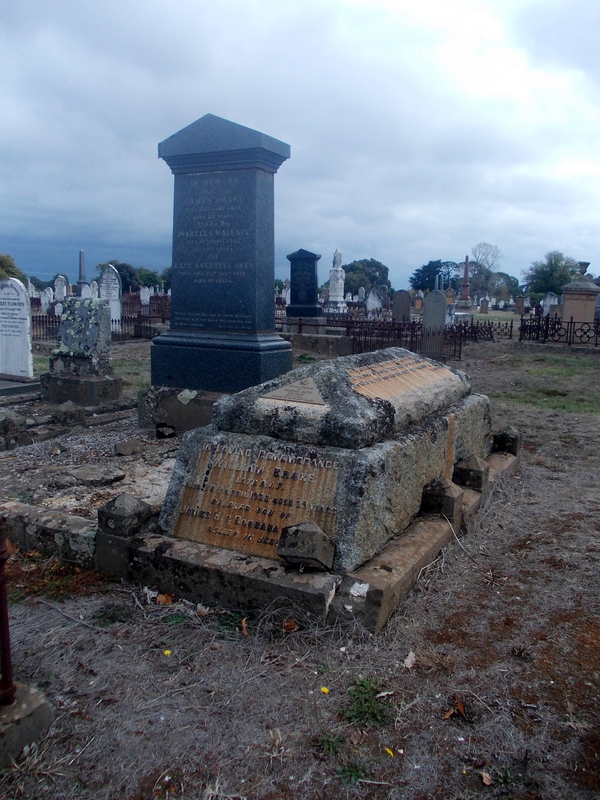 GRAVE OF WILLIAM BRAKE, HAMILTON OLD CEMETERY.